Browse > Home / Public Policy, Tech / Thanks to Gov. Brown, Will Solar Energy Ever Hit Its Stride? Solar energy has always been a concern of mine. So, two major news headlines surrounding two solar-energy projects were certainly more than disturbing back in 2011. That being the $535 million federally guaranteed loan to Solyndra and the $1.2 billion loan guarantee to SunPower. True, they smacked of cronyism by the Obama Administration. The two tragedies have harmed the potential of solar-energy development as green resource. Prior to the negative stories, my fingers were crossed. With ever-increasing utility costs, there’s been a green puzzle for decades – why hasn’t an entrepreneur solved the economics for the solar-energy mystery? Why hasn’t it exploded in popularity? It’s been a long haul for solar energy, which has had promise for decades. So, an earlier headline in The Desert Sun newspaper caught my eye. The Palm Springs newspaper’s article, “Gov. Jerry Brown sees future in massive solar plant near Blythe,” prompted exciting memories from my early career in the California desert. Yes, in his second term more than three decades after his first, the article pointed out the Democrat was at it again – promoting green initiatives and fiscal conservatism. He had recently vetoed the Democrat-backed state budget before he toured a solar-energy project site. The year was 1977. I was a young news director of an all-news radio station in the small Palm Springs market. But it was a prestigious market as the listeners expected us to sound like a first-rate, big city station. Many residents were wealthy, either as retirees or who maintained second homes as retreats from their frigid big-city home towns in the U.S. The competition was fierce. The market had too many radio stations for its size. So the staff and I worked very hard to beat the competition. The telephone was a valuable tool. One day, I was told a listener was on the telephone – “May I speak with Terry Corbell?” asked the caller. I was stunned as I instantly recognized the famous and deep cavernous voice. “This can’t be Del Sharbutt!” I exclaimed. I felt like a 10-year-old who just realized his dream of going to Disneyland for the first time. Yes, it was the legendary broadcaster who had just retired as a news anchor at the Mutual Broadcasting System, which at that time was the world’s largest radio network. Mr. Sharbutt had a storied career. In the 1940s, he was an emcee for Frank Sinatra on “Your Hit Parade” broadcasts. Also on radio as a CBS staff announcer, he introduced many other stars including Bob Hope, Bing Crosby, Robert Benchley, and the Dorsey Brothers. Mr. Sharbutt called to request public service time for a non-profit program, “The Alcohol Awareness Hour,” at Eisenhower Medical Center, which eventually led to the Betty Ford Clinic. We had just been rewarded for our strategies and efforts with a meteoric 14-share of the market’s ratings – No. 1 in male demographics – 90 percent of the men aged 18+ listened to us. We were not nearly as successful in attracting female listeners despite regularly beating the competition. So we programmed more news for women and we continually we enhanced our sound. We really became the envy of our competitors after Mr. Sharbutt deep-voiced our station’s image liners with “The news authority – 1270, KGUY Newsradio,” which was linked to electrifying music as we began each hour of news broadcasts. The stories were thrilling for me as young journalist. I enjoyed breaking many exclusives. They included the nationwide story about the retirement plans of former President Gerald Ford; Nancy Reagan, who was in town to fundraise for her husband’s second presidential campaign; and the scoop with Noah Dietrich on how he helped Howard Hughes build his financial empire. I made a lot of extra money freelancing those reports nationally on NBC/NIS, and later on Mutual and on KNX Newsradio in Los Angeles. However, I believed no story was bigger than solar energy. Each month, it cost a fortune to air condition a home in the desert, especially when temperatures reached 110 to 120 degrees in July and August. So we voraciously covered renewable energy. Fortunately, the telephone rang a lot. As an all-news station, we had a huge news-pipeline to fill. Renewable-energy stories included geothermal, wind and solar. The stories were prompted, in part, because I was regularly telephoned by a local energy-advocating gadfly, Bill Byrne, whom I liked. So the catalyst was sage advice from Gov. Moonbeam? Gov. Brown was given the label by Chicago newspaper columnist Mike Royko. The governor’s environmental pursuits weren’t universally popular – including when he innovatively sought history’s first tax incentive for rooftop solar energy. Ironically, Gov. Brown had a more distinguished track record as a fiscally conservative governor than Ronald Reagan. But Mr. Reagan was more popular in Palm Springs than Mr. Brown. There was a resurgence of solar-energy headlines, including “With DOE loan, 1366 closer to slicing solar costs.” The four-year-old startup, 1366 Technologies, wants to make solar energy less expensive than coal. It’s getting a $150 million loan from the Dept. of Energy to build factories. The goal is to make silicon wafers for solar photovoltaic panels. Here’s another headline: “Google creates $280-million solar power fund.” Google wanted to accelerate the household-use of solar energy. It’s partnering with a San Mateo, Calif. Company, SolarCity. Google’s investment will underwrite installation and maintenance costs, which will be coordinated by SolarCity. 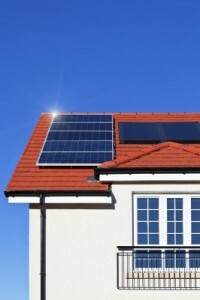 Homeowners will pay for the resulting electricity and on a monthly basis. Google will get a percentage of the payments. Google isn’t SolarCity’s only partner. Other projects include financial underwriters Citigroup and U.S. Bancorp. So, will use of solar energy finally become commonplace? It’s fun to see news accounts of Gov. Brown doing his thing to help solar energy hit its stride. But let’s hope it works. For business and consumers, green is good for the environment and is more economical in the long run. From the Coach’s Corner, Consumers love environmentally sensitive businesses. You might think it’s a slam dunk for businesses to market themselves as green. Well, yes and no. There are precautions to take. They include educating your audience on your eco practices. Here’s the Checklist for Branding, Selling Your Biz as Green.